3DPT would like to recognize Monica Matteo as our January Patient of the Month! 3DPT: Tell us about your injury that brought you to 3DPT? Monica: I re-ruptured my ACL while landing from a leap during dance class. In addition to the ruptured ACL, I tore my meniscus. 3DPT: What is your favorite part of coming to physical therapy? Monica: I love that whenever I go to physical therapy I have someone who understands exactly what I need to do in order to get back to dancing again. I love being able to incorporate dance into my recovery process this time around. It makes it a lot more fun! 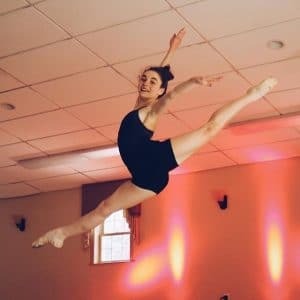 3DPT: What goals do you have after leaving physical therapy and in the next 5 years in terms of dancing? Monica: I would really like to keep increasing my strength, not only in my leg, but in all areas so I can prevent getting injured again! In terms of the next five years, I plan on training hard in dance and taking a variety of classes. I’d like to eventually try out for the dance program at Broadway Dance Center in NY. 3DPT: What has the hardest part of physical therapy been so far? Monica: I would say that getting the flexion in my knee back was definitely the hardest part so far. My meniscus repair made bending my leg again extremely difficult. However, after trying so many different ways to stretch it with Allison, it is where it needs to be now! 3DPT: Why would you recommend 3DPT? Monica: The staff is so friendly and nice! Also, they really care about what they’re doing and take into account your goals and help you to achieve them!